Next, we have this project by UOA group. A sign broad have been set up behind Diamond Square, open for registration. I called on last Saturday to register my interest. Trying to dig some information from the call. I were told the project is going to launch end of the year... and the condo price is expecting starting from RM300k with 1,000++ sq ft. There's an empty land behind Diamond Square. Diamond Square currently are half die or rather half alive. Not all shop lots are occupied. But nearby have Diamond Residences and another condo, forget its name, shd be also Diamond something. The vacant land from another view. 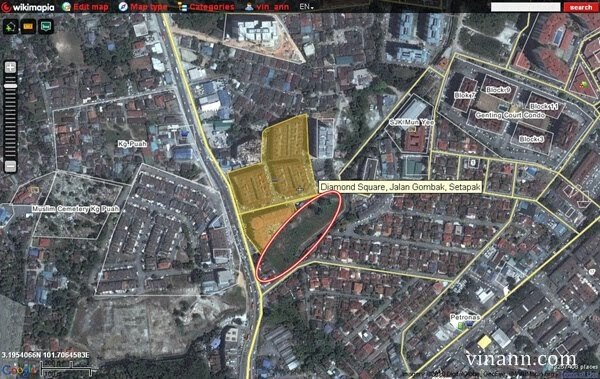 The Map of the vacant land of UOA condo. Hope im right. Diamond Square is going to get a new life when all these condos completed. Its going to be another Prima Setapak with high density, but its need few more years for all these condo to complete and residences start to move in. At the movement, just wonder although there's are two condo beside Diamond square, why its still half dead.